Easter is coming up, as at the time of writing this. Where do you go to buy Easter eggs for friends and loved ones in Sydney? I feel like the David Jones Food Hall is one of the classic places to buy Easter eggs, and for good reason too. Their range is excellent and there's usually some adorable chocolates that you don't really see anywhere else. Try and battle your way through the line at Haigh's Strand store - it's always teeming with people around Easter Time! Sadly I'm pretty boring and unoriginal when it comes to buying Easter eggs, and get them from the grocery store. Mostly because the fancy Easter eggs are rarely ever gluten free, so I have to stick to plain old Cadbury (although they've changed manufacturing processes, so that might be out this year too!). All I can say is, please consider dairy-free (ie cruelty-free) alternatives. 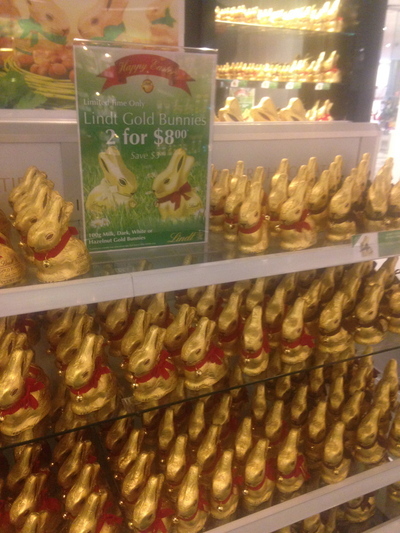 The Lindt Gold Dark bunnies are cruelty-free, as well as some of Haigh's dark chocolates. Please see my two articles on the dairy and egg industries for information about the cruelty involved. Haigh's chocolates are also palm oil free, which is fantastic! Best way to get to Taronga Zoo? Best place to run in Sydney?